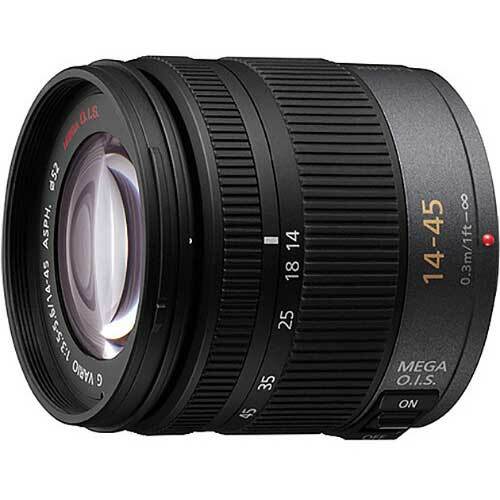 Lens Description: A standard zoom interchangeable lens designed specifically for the cameras compatible with Micro Four Thirds System standard. Suitable for a wide range of scenes from portrait to landscape photography, the lens offers a zoom range of 14-45mm (35mm equivalent: 28-90mm) while featuring its ultra-compact size and lightweight. The aspherical lens element also improves optical performance by minimizing distortion, even at the 28mm wide end. The lens incorporates Panasonic's MEGA O.I.S. optical image stabilizer, which makes it easy to shoot super clear shots even in low-lit situations by suppressing the blur caused by a hand shake. When the lens is mounted on the Lumix G Micro System DMC-G1 camera, you can use the contrast AF system, which is implemented in the DMC-G1 to offer a wide variety of convenient functions. With its minimum focus distance of 30 cm even at full zoom, the lens provides a maximum photographic magnification of 0.34x. Obviously this is a kit lens, I ordered one for my Olympus OMD E M5 after reading that it was a bit sharper than the Olympus kit lens, it exhibited some blue and purple fringing, aka chromatic aberration, after a little research I got a UV 2A filter which corrected the problem very nicely and now I find it to be a favorite lens.